The Citizenship Clause of the Fourteenth Amendment must be interpreted in light of English common law, and thus it grants U.S. citizenship to all children born to alien parents on American soil, with only a limited set of exceptions. McKenna took no part in the consideration or decision of the case. United States v. Wong Kim Ark, 169 U.S. 649 (1898), is a United States Supreme Court case in which the Court ruled that "a child born in the United States, of parents of Chinese descent, who, at the time of his birth, are subjects of the Emperor of China, but have a permanent domicil and residence in the United States, and are there carrying on business, and are not employed in any diplomatic or official capacity under the Emperor of China", automatically became a U.S. citizen at birth. This decision established an important precedent in its interpretation of the Citizenship Clause of the Fourteenth Amendment to the Constitution. Wong Kim Ark, who was born in San Francisco in 1873, had been denied re-entry to the United States after a trip abroad, under a law restricting Chinese immigration and prohibiting immigrants from China from becoming naturalized U.S. citizens. He challenged the government's refusal to recognize his citizenship, and the Supreme Court ruled in his favor, holding that the citizenship language in the Fourteenth Amendment encompassed the circumstances of his birth and could not be limited in its effect by an act of Congress. The case highlighted disagreements over the precise meaning of one phrase in the Citizenship Clause—namely, the provision that a person born in the United States who is subject to the jurisdiction thereof acquires automatic citizenship. The Supreme Court's majority concluded that this phrase referred to being required to obey U.S. law; on this basis, they interpreted the language of the Fourteenth Amendment in a way that granted U.S. citizenship to children born of foreigners (a concept known as jus soli), with only a limited set of exceptions mostly based in English common law.. The court's dissenters argued that being subject to the jurisdiction of the United States meant not being subject to any foreign power—that is, not being claimed as a citizen by another country via jus sanguinis (inheriting citizenship from a parent)—an interpretation which, in the minority's view, would have excluded "the children of foreigners, happening to be born to them while passing through the country". In the words of a 2007 legal analysis of events following the Wong Kim Ark decision, "The parameters of the jus soli principle, as stated by the court in Wong Kim Ark, have never been seriously questioned by the Supreme Court, and have been accepted as dogma by lower courts." A 2010 review of the history of the Citizenship Clause notes that the Wong Kim Ark decision held that the guarantee of birthright citizenship "applies to children of foreigners present on American soil" and states that the Supreme Court "has not re-examined this issue since the concept of 'illegal alien' entered the language". Since the 1990s, however, controversy has arisen over the longstanding practice of granting automatic citizenship to U.S.-born children of illegal immigrants, and legal scholars disagree over whether the Wong Kim Ark precedent applies when alien parents are in the country illegally. Attempts have been made from time to time in Congress to restrict birthright citizenship, either via statutory redefinition of the term jurisdiction, or by overriding both the Wong Kim Ark ruling and the Citizenship Clause itself through an amendment to the Constitution, but no such proposal has been enacted. United States citizenship law is founded on two traditional principles—jus soli ("right of the soil"; a "common law" doctrine), and jus sanguinis ("right of the blood"; a "civil law" doctrine). Under jus soli, a child's citizenship would be acquired by birth within a country's territory, without reference to the political status or condition of the child's parents. Under jus sanguinis, the citizenship of a child would not depend on his or her place of birth, but instead follow the status of a parent (specifically, the father—or, in the case of an illegitimate birth, the mother). Throughout the history of the United States, the dominant legal principle governing citizenship has been jus soli—the principle that birth within the territorial limits of the United States confers automatic citizenship, excluding slaves before the American Civil War. Although there was no actual definition of citizenship in United States law until after the Civil War, it was generally accepted that anyone born in the United States was automatically a citizen. This applicability of jus soli, via the common law inherited in the United States from England, was upheld in an 1844 New York state case, Lynch v. Clarke, in which it was held that a woman born in New York City, of alien parents temporarily sojourning there, was a U.S. citizen. United States citizenship could also be acquired at birth via jus sanguinis (birth outside the country to a citizen parent), a right confirmed by Congress in the Naturalization Act of 1790. Additionally, alien immigrants to the United States could acquire citizenship via a process of naturalization—though access to naturalization was originally limited to "free white person[s]". African slaves were originally excluded from United States citizenship. In 1857, the United States Supreme Court held in Dred Scott v. Sandford that slaves, former slaves, and their descendants were not eligible under the Constitution to be citizens. Additionally, American Indians were not originally recognized as citizens, since Indian tribes were considered to be outside the jurisdiction of the U.S. government. After the Civil War and the subsequent abolition of slavery, Congress enacted the Civil Rights Act of 1866. One provision of this law declared as citizens, not only the freed slaves, but "all persons born in the United States and not subject to any foreign power, excluding Indians not taxed". Concerns were raised that the citizenship guarantee in the Civil Rights Act might be repealed by a later Congress or struck down as unconstitutional by the courts. Soon after the passage of the Act, Congress drafted the Fourteenth Amendment to the Constitution and sent it to the states for ratification (a process which was completed in 1868). Among the Fourteenth Amendment's many provisions was the Citizenship Clause, which entrenched a guarantee of citizenship in the Constitution by stating, "All persons born or naturalized in the United States, and subject to the jurisdiction thereof, are citizens of the United States and of the State wherein they reside." Howard said that the clause "is simply declaratory of what I regard as the law of the land already, that every person born within the limits of the United States, and subject to their jurisdiction, is by virtue of natural law and national law a citizen of the United States." He added that citizenship "will not, of course, include persons born in the United States who are foreigners, aliens, who belong to the families of ambassadors or foreign ministers accredited to the Government of the United States, but will include every other class of persons" —a comment which would later raise questions as to whether Congress had originally intended that U.S.-born children of foreign parents were to be included as citizens. Responding to concerns expressed by Edgar Cowan of Pennsylvania that liberalizing the right to citizenship might result in certain states being taken over by large populations of undesirable foreign immigrants, John Conness of California predicted that the Chinese population in California would likely remain very small, in large part because Chinese immigrants almost always eventually returned to China, and also because very few Chinese women left their homeland to come to the United States. James R. Doolittle of Wisconsin objected that the citizenship provision would not be sufficiently narrow to exclude American Indians from citizenship, and in an attempt to address this issue, he proposed to add a phrase taken from the Civil Rights Act—"excluding Indians not taxed". Although most Senators agreed that birthright citizenship should not be extended to the Indians, a majority saw no need to clarify the issue, and Doolittle's proposal was voted down. Upon its return to the House of Representatives, the proposed Fourteenth Amendment received little debate; no one spoke in opposition to the Senate's addition of the Citizenship Clause, and the complete proposed amendment was approved by the House on June 13, 1866, and declared to have been ratified on July 28, 1868. In 2006, Goodwin Liu, then an assistant professor at the Boalt Hall law school of the University of California, Berkeley, and later an Associate Justice of the California Supreme Court, wrote that although the legislative history of the Citizenship Clause is "somewhat thin", the clause's central role is evident in the historical context of the post-Civil War period. Elizabeth Wydra, chief counsel of the Constitutional Accountability Center (a progressive think tank), argues that both supporters and opponents of the Citizenship Clause in 1866 shared the understanding that it would automatically grant citizenship to all persons born in the United States (except children of foreign ministers and invading armies)—an interpretation shared by Texas Solicitor General James C. Ho. Richard Aynes, dean of the University of Akron School of Law, takes a different view, proposing that the Citizenship Clause had "consequences which were unintended by the framers". Like many other immigrants, Chinese were drawn to the United States—initially to participate in the California Gold Rush of 1849, then moving on to railroad construction, farming, and work in cities. An 1868 treaty (named the Burlingame Treaty after one of the American negotiators) expanded trade and migration between the United States and China. The treaty did not address the citizenship of children born in the United States to Chinese parents, or vice versa. Regarding naturalization (acquisition of citizenship other than at birth), the treaty contained a provision stating that "nothing herein contained shall be held to confer naturalization ... upon the subjects of China in the United States." Chinese immigrants to the United States were met with considerable distrust, resentment, and discrimination almost from the time of their first arrival. Many politicians argued that the Chinese were so different in so many ways that they not only would never (or even could) assimilate into American culture, but that they represented a threat to the country's principles and institutions. In this climate of popular anti-Chinese sentiment, Congress in 1882 enacted the Chinese Exclusion Act, which placed limits on Chinese immigration to the United States. (The original Chinese Exclusion Act was amended several times—such as by the 1888 Scott Act and the 1892 Geary Act—and as a result, it is sometimes referred to in the plural as the "Chinese Exclusion Acts".) Chinese already in the U.S. were allowed to stay, but they were ineligible for naturalization and, if they left the U.S. and later wished to return, they needed to apply anew and obtain approval again. Chinese laborers and miners were specifically barred from coming (or returning) to the United States under the terms of the law. After the adoption of the Fourteenth Amendment in 1868 and prior to the Wong Kim Ark case, the question of jus soli citizenship for children of aliens arose only with reference to American Indians and Chinese. The Supreme Court ruled in an 1884 case (Elk v. Wilkins) that an Indian born on a reservation did not acquire United States citizenship at birth (because he was not subject to U.S. jurisdiction) and could not claim citizenship later on merely by moving to non-reservation U.S. territory and renouncing his former tribal allegiance. American Indians were subsequently granted citizenship by an act of Congress in 1924. In an 1892 case, Gee Fook Sing v. U.S., a federal appeals court in California for the same circuit (by this time known as the Ninth Circuit Court of Appeals) concluded that a Chinese man would have been recognized as a United States citizen if he could have presented satisfactory evidence that he had in fact been born in the U.S. This case was also never brought before the Supreme Court. The Supreme Court's 1873 Slaughterhouse Cases decision contained the statement that "The phrase, 'subject to its jurisdiction,' was intended to exclude from its operation children of ministers, consuls, and citizens or subjects of foreign states born within the United States." However, since the Slaughterhouse Cases did not deal with claims of birthright citizenship, this comment was dismissed in Wong Kim Ark and later cases as a passing remark (obiter dictum) lacking any force as a controlling precedent. As to whether the Wong Kim Ark decision was correct on this point or not, modern scholars are divided. Wong Kim Ark (Chinese: 黃金德; Taishanese: Wōng Gim-ak) was born in San Francisco. Various sources state or imply his year of birth as being 1873, 1871, or 1868. His father, Wong Si Ping (Chinese: 黃四平), and mother, Wee Lee (Chinese: 李薇), were immigrants from China and were not United States citizens, as the Naturalization Law of 1802 had made them ineligible for naturalization either before or after his birth. Wong worked in San Francisco as a cook. Wong visited China in 1890, and upon his return to the United States in July 1890, he was readmitted without incident because of his U.S. citizenship. In November 1894, Wong sailed to China for another temporary visit, but when he returned in August 1895, he was detained at the Port of San Francisco by the Collector of Customs, who denied him permission to enter the country, arguing that Wong was not a U.S. citizen despite his having been born in the U.S., but was instead a Chinese subject because his parents were Chinese. Wong was confined for five months on steamships off the coast of San Francisco while his case was being tried. According to Salyer, the San Francisco attorney George Collins had tried to persuade the federal Justice Department to bring a Chinese birthright citizenship case before the Supreme Court. An article by Collins was published in the May/June 1895 American Law Review, criticizing the Look Tin Sing ruling and the federal government's unwillingness to challenge it, and advocating the international law view of jus sanguinis citizenship. Eventually, Collins was able to convince U.S. Attorney Henry Foote, who "searched for a viable test case and settled on Wong Kim Ark". An 1894 notarized statement by witnesses attesting to the identity of Wong Kim Ark. A photograph of Wong is affixed to the statement. With the assistance of legal representation by the Chinese Consolidated Benevolent Association, Wong Kim Ark challenged the refusal to recognize his birth claim to U.S. citizenship, and a petition for a writ of habeas corpus was filed on his behalf in federal district court. The arguments presented before District Judge William W. Morrow centered on which of two competing interpretations of the phrase subject to the jurisdiction thereof in the Citizenship Clause should govern a situation involving a child born in the United States to alien parents. Wong's attorneys argued that the phrase meant "'subject to the laws of the United States,' comprehending, in this expression, the allegiance that aliens owe in a foreign country to obey its laws"—an interpretation, based on the common law inherited by the United States from England, that would encompass essentially everyone born in the U.S. via the principle of jus soli (citizenship based on place of birth). The U.S. government claimed that subject to the jurisdiction thereof meant "to be subject to the political jurisdiction of the United States"—an interpretation, based on international law, which would exclude parents and their children who owed allegiance to another country via the principle of jus sanguinis (citizenship inherited from a parent). The question of the citizenship status of U.S.-born children of alien parents had, up to this time, never been decided by the Supreme Court. The U.S. government argued that Wong's claim to U.S. citizenship was ruled out by the Supreme Court's interpretation of jurisdiction in its 1873 Slaughterhouse Cases ruling, but the district judge concluded that the language in question was obiter dictum and not directly relevant to the case at hand. The government also cited a similar statement in Elk v. Wilkins, but the judge was not convinced by this argument either. Wong's attorneys cited the Look Tin Sing case, and the district judge agreed that in the absence of clear direction from the Supreme Court, this case definitively settled the question of citizenship for Wong and others like him as far as federal courts in the Ninth Circuit were concerned. The judge saw the Look Tin Sing holding reaffirmed in the Gee Fook Sing case and noted further that another part of the Supreme Court's Slaughterhouse Cases opinion said that "it is only necessary that [a man] should be born or naturalized in the United States to be a citizen of the Union." Concluding that the Look Tin Sing decision constituted a controlling precedent in the Ninth Circuit, Judge Morrow ruled that subject to the jurisdiction thereof referred to being subject to U.S. law (the first of the two proposed interpretations). On January 3, 1896, the judge declared Wong Kim Ark to be a citizen because he was born in the U.S. The U.S. government appealed the district court ruling directly to the United States Supreme Court. According to Salyer, government officials—realizing that the decision in this case "was of great importance, not just to Chinese Americans, but to all American citizens who had been born to alien parents", and concerned about the possible effect of an early ruling by the Supreme Court on the 1896 presidential election—delayed the timing of their appeal so as to avoid the possibility of a decision based more on policy concerns than the merits of the case. Oral arguments before the Supreme Court were held on March 5, 1897. Solicitor General Holmes Conrad presented the government's case; Wong was represented before the Court by Maxwell Evarts, former U.S. Assistant Attorney General J. Hubley Ashton, and Thomas D. Riordan. The Supreme Court considered the "single question" in the case to be "whether a child born in the United States, of parent[s] of Chinese descent, who, at the time of his birth, are subjects of the Emperor of China, but have a permanent domicil and residence in the United States, and are there carrying on business, and are not employed in any diplomatic or official capacity under the Emperor of China, becomes at the time of his birth a citizen of the United States." It was conceded that if Wong was a U.S. citizen, "the acts of congress known as the 'Chinese Exclusion Acts,' prohibiting persons of the Chinese race, and especially Chinese laborers, from coming into the United States, do not and cannot apply to him." Associate Justice Horace Gray wrote the opinion of the Court in the Wong Kim Ark case. In a 6–2 decision issued on March 28, 1898, the Supreme Court held that Wong Kim Ark had acquired U.S. citizenship at birth and that "the American citizenship which Wong Kim Ark acquired by birth within the United States has not been lost or taken away by anything happening since his birth." The opinion of the Court was written by Associate Justice Horace Gray and was joined by Associate Justices David J. Brewer, Henry B. Brown, George Shiras Jr., Edward Douglass White, and Rufus W. Peckham. Upholding the concept of jus soli (citizenship based on place of birth), the Court held that the Citizenship Clause needed to be interpreted in light of English common law, which had included as subjects virtually all native-born children, excluding only those who were born to foreign rulers or diplomats, born on foreign public ships, or born to enemy forces engaged in hostile occupation of the country's territory. The court's majority held that the subject to the jurisdiction phrase in the Citizenship Clause excluded from U.S. citizenship only those persons covered by one of these three exceptions (plus a fourth "single additional exception"—namely, that Indian tribes "not taxed" were not considered subject to U.S. jurisdiction). The majority concluded that none of these four exceptions to U.S. jurisdiction applied to Wong; in particular, they observed that "during all the time of their said residence in the United States, as domiciled residents therein, the said mother and father of said Wong Kim Ark were engaged in the prosecution of business, and were never engaged in any diplomatic or official capacity under the emperor of China". Quoting approvingly from an 1812 case, The Schooner Exchange v. M'Faddon, in which Chief Justice John Marshall said, "The jurisdiction of the nation within its own territory is necessarily exclusive and absolute"—and agreeing with the district judge who had heard Wong's original habeas corpus petition that comments in the Slaughterhouse Cases about the citizenship status of children born to non-citizen parents did not constitute a binding precedent—the Court ruled that Wong was a U.S. citizen from birth, via the Fourteenth Amendment, and that the restrictions of the Chinese Exclusion Act did not apply to him. An act of Congress, they held, does not trump the Constitution; such a law "cannot control [the Constitution's] meaning, or impair its effect, but must be construed and executed in subordination to its provisions." The majority opinion referred to Calvin's Case (1608) as stating the fundamental common law principle that all people born within the King's "allegiance" were subjects, including children of "aliens in amity". 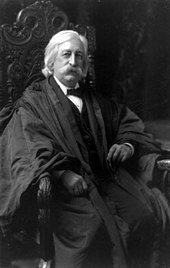 Chief Justice Melville Fuller wrote the dissent in the Wong Kim Ark case. Chief Justice Melville Fuller was joined by Associate Justice John Harlan in a dissent which, "for the most part, may be said to be predicated upon the recognition of the international law doctrine". The dissenters argued that the history of U.S. citizenship law had broken with English common law tradition after independence—citing as an example the embracing in the U.S. of the right of expatriation (giving up of one's native citizenship) and the rejection of the contrary British doctrine of perpetual allegiance. The dissenters argued that the principle of jus sanguinis (that is, the concept of a child inheriting his or her father's citizenship by descent regardless of birthplace) had been more pervasive in U.S. legal history since independence. Based on an assessment of U.S. and Chinese treaty and naturalization law, the dissenters claimed that "the children of Chinese born in this country do not, ipso facto, become citizens of the United States unless the fourteenth amendment overrides both treaty and statute." Pointing to the language of the Civil Rights Act of 1866, an act of Congress which declared to be citizens "all persons born in the United States and not subject to any foreign power, excluding Indians not taxed", and which was enacted into law only two months before the Fourteenth Amendment was proposed by Congress, the dissenters argued that "it is not open to reasonable doubt that the words 'subject to the jurisdiction thereof,' in the amendment, were used as synonymous with the words 'and not subject to any foreign power'". In the dissenters' view, excessive reliance on jus soli (birthplace) as the principal determiner of citizenship would lead to an untenable state of affairs in which "the children of foreigners, happening to be born to them while passing through the country, whether of royal parentage or not, or whether of the Mongolian, Malay or other race, were eligible to the presidency, while children of our citizens, born abroad, were not." The dissenters acknowledged that other children of foreigners—including former slaves—had, over the years, acquired U.S. citizenship through birth on U.S. soil. But they still saw a difference between those people and U.S.-born individuals of Chinese ancestry, because of strong cultural traditions discouraging Chinese immigrants from assimilating into mainstream American society, Chinese laws of the time which made renouncing allegiance to the Chinese emperor a capital crime, and the provisions of the Chinese Exclusion Act making Chinese immigrants already in the United States ineligible for citizenship. The question for the dissenters was "not whether [Wong Kim Ark] was born in the U.S. or subject to the jurisdiction thereof ... but whether his or her parents have the ability, under U.S. or foreign law, statutory or treaty-based, to become citizens of the U.S. themselves". In a lecture to a group of law students shortly before the decision was released, Harlan commented that the Chinese had long been excluded from American society "upon the idea that this is a race utterly foreign to us and never will assimilate with us." Without the exclusion legislation, Harlan stated his opinion that vast numbers of Chinese "would have rooted out the American population" in the western United States. Acknowledging the opposing view supporting citizenship for American-born Chinese, he said that "Of course, the argument on the other side is that the very words of the constitution embrace such a case." Commenting on the Wong Kim Ark case shortly after the issuance of the Court's ruling in 1898, San Francisco attorney Marshall B. Woodworth wrote that "the error the dissent apparently falls into is that it does not recognize that the United States, as a sovereign power, has the right to adopt any rule of citizenship it may see fit and that the rule of international law does not furnish [by its own force] the sole and exclusive test of citizenship of the United States". In an analysis of the Wong Kim Ark case written shortly after the decision in 1898, Marshall B. Woodworth laid out the two competing theories of jurisdiction in the Citizenship Clause and observed that "[t]he fact that the decision of the court was not unanimous indicates that the question is at least debatable." Woodworth concluded, however, that the Supreme Court's ruling laid the issue to rest, saying that "it is difficult to see what valid objection can be raised thereto". Another analysis of the case, published by the Yale Law Journal (1898), favored the dissenting view. An editorial published in the San Francisco Chronicle on March 30, 1898, expressed concern that the Wong Kim Ark ruling (issued two days previously) "may have a wider effect upon the question of citizenship than the public supposes"—specifically, that it might lead to citizenship and voting rights not only for Chinese but also Japanese and American Indians. The editorial suggested that "it may become necessary ... to amend the Federal Constitution and definitely limit citizenship to whites and blacks." As a result of Wong Kim Ark's U.S. citizenship being confirmed by the Supreme Court, Wong's eldest son came to the United States from China in 1910, seeking recognition as a citizen via jus sanguinis, but U.S. immigration officials claimed to see discrepancies in the testimony at his immigration hearing and refused to accept Wong's claim that the boy was his son. Wong's other three sons came to the United States between 1924 and 1926 and were accepted as citizens. Because of his citizenship, Wong Kim Ark's youngest son was drafted in World War II, and later made a career in the United States Merchant Marines. Current U.S. law on birthright citizenship (citizenship acquired at birth) acknowledges both citizenship through place of birth (jus soli) and citizenship inherited from parents (jus sanguinis). Before Wong Kim Ark, the Supreme Court had held in Elk v. Wilkins (1884) that birthplace by itself was not sufficient to grant citizenship to a Native American; however, Congress eventually granted full citizenship to American Indians via the Indian Citizenship Act of 1924. Restrictions on immigration and naturalization of Chinese were eventually lifted as a consequence of the Chinese Exclusion Repeal Act of 1943 (also known as the Magnuson Act) and the Immigration and Nationality Act of 1965. Some legal scholars, opposed to the idea that jus soli should apply to the children of illegal aliens, have argued that the Wong Kim Ark precedent does not apply when alien parents are in the country illegally. John C. Eastman, a former dean of the Chapman University School of Law, has argued that Wong Kim Ark does not entitle U.S.-born children of illegal aliens to gain automatic citizenship because, in his opinion, being subject to the jurisdiction of the United States requires a status of "full and complete jurisdiction" that does not apply to aliens who are in the country illegally. Eastman further argues that the Wong Kim Ark decision was fundamentally flawed in the way it dealt with the concept of jurisdiction, and that the Indian Citizenship Act of 1924—which followed Wong Kim Ark—would not have been necessary if Congress had believed "that the Citizenship Clause confers citizenship merely by accident of birth." A similar analysis of the jurisdiction question has been proposed by Professor Peter H. Schuck of the Yale School of Law and Rogers M. Smith, political science professor at Yale. According to law professor Lino Graglia of the University of Texas, even if Wong Kim Ark settled the status of children of legal residents, it did not do so for children of illegal residents; Graglia asserts that the case weighs against automatic birthright for illegal immigrants because the Court denied such citizenship for an analogous group, namely "children of alien enemies, born during and within their hostile occupation". Some legal scholars still argue that the Wong Kim Ark ruling should be overturned through legislative means. Richard Posner, a judge of the Seventh Circuit Court of Appeals, has criticized the granting of citizenship to U.S.-born children of illegal immigrants, suggesting that Congress can and should act to change this policy. Charles Wood, former counsel to the Senate Judiciary Committee's subcommittee on immigration, has also opposed the practice, urging (in 1999) that it be stopped as quickly as possible, either by an act of Congress or a constitutional amendment. However, in the words of Lucy Salyer, "the birthright citizenship doctrine of Wong Kim Ark has remained intact for over a century, still perceived by most to be a natural and well-established rule in accordance with American principles and practice. It is unlikely to be uprooted easily." In response to public reaction against immigration and fears that U.S.-born children of illegal immigrants could serve as links to permit legal residency and eventual citizenship for family members who would otherwise be ineligible to remain in the country, bills have been introduced from time to time in Congress which have challenged the conventional interpretation of the Citizenship Clause and have sought (thus far unsuccessfully) to actively and explicitly deny citizenship at birth to U.S.-born children of foreign visitors or illegal aliens. As one example among many, the "Birthright Citizenship Act of 2009"—introduced in the House of Representatives of the 111th Congress as H.R. 1868, by Representative Nathan Deal of Georgia—was an attempt to exclude U.S.-born children of illegal immigrants from being considered subject to the jurisdiction of the United States for purposes of the Citizenship Clause. A similar proposal—named the "Birthright Citizenship Act of 2011"—was introduced in the House as H.R. 140 in the (112th) Congress on January 5, 2011 by Representative Steve King of Iowa, and in the Senate as S. 723 on April 5, 2011 by Senator David Vitter of Louisiana. Neither bill was discussed in Congress prior to the end of the session. On October 30, 2018, President Donald Trump announced his intention to issue an executive order abolishing birthright citizenship for U.S.-born children of non-citizens. On this same date, Senator Lindsey Graham of South Carolina said he would introduce legislation in Congress to accomplish the same thing. Jon Feere, of the Center for Immigration Studies (CIS), has said that "Several legal scholars and political scientists who have delved into the history of the 14th Amendment have concluded that 'subject to the jurisdiction thereof' has no plain meaning". Commenting on Trump's idea of an executive order, Speaker of the House Paul Ryan said "you obviously cannot do that.... I think in this case the 14th Amendment is pretty clear, and that would involve a very, very lengthy constitutional process." Mark Krikorian, executive director of the CIS, said that if Trump follows through on his plan, "This will set up the court fight.... the order will be enjoined, [and the] case will eventually reach [the Supreme Court], which then will finally have to rule on the meaning of 'subject to the jurisdiction.'" As of December 25, 2018, neither Trump's promised executive order nor Graham's planned bill have materialized. ^ a b "The Constitution nowhere defines the meaning of these words, either by way of inclusion or of exclusion, except insofar as this is done by the affirmative declaration that 'all persons born or naturalized in the United States, and subject to the jurisdiction thereof, are citizens of the United States.' In this as in other respects, it must be interpreted in the light of the common law, the principles and history of which were familiarly known to the framers of the Constitution." ^ a b c Wong Kim Ark, 169 U.S. at 693. "The foregoing considerations and authorities irresistibly lead us to these conclusions: the Fourteenth Amendment affirms the ancient and fundamental rule of citizenship by birth within the territory, in the allegiance and under the protection of the country, including all children here born of resident aliens, with the exceptions or qualifications (as old as the rule itself) of children of foreign sovereigns or their ministers, or born on foreign public ships, or of enemies within and during a hostile occupation of part of our territory, and with the single additional exception of children of members of the Indian tribes owing direct allegiance to their several tribes." ^ a b Glen (2007), pp. 74–76. "At common law, the fundamental principle relating to English nationality was that of jus soli; children born in England, including to friendly aliens, would be deemed natural-born subjects. The only exceptions to this principle were children born to foreign diplomats and those born to alien enemies.... [T]he Fourteenth Amendment, by its clear terms, establish the U.S. citizenship of every child born within its jurisdiction, no matter the race or color, so long as they do not fall within one of the recognized exceptions to jus soli." ^ a b Wong Kim Ark, 169 U.S. at 653. "The question presented by the record is whether a child born in the United States, of parents of Chinese descent, who, at the time of his birth, are subjects of the Emperor of China, but have a permanent domicil and residence in the United States, and are there carrying on business, and are not employed in any diplomatic or official capacity under the Emperor of China, becomes at the time of his birth a citizen of the United States by virtue of the first clause of the Fourteenth Amendment of the Constitution, 'All persons born or naturalized in the United States, and subject to the jurisdiction thereof, are citizens of the United States and of the State wherein they reside.'" ^ a b Wong Kim Ark, 169 U.S. at 705. "The evident intention, and the necessary effect, of the submission of this case to the decision of the court upon the facts agreed by the parties were to present for determination the single question stated at the beginning of this opinion, namely, whether a child born in the United States, of parent "[sic]" of Chinese descent, who, at the time of his birth, are subjects of the Emperor of China, but have a permanent domicil and residence in the United States, and are there carrying on business, and are not employed in any diplomatic or official capacity under the Emperor of China, becomes at the time of his birth a citizen of the United States. For the reasons above stated, this court is of opinion that the question must be answered in the affirmative." ^ "Donald Trump meet Wong Kim Ark, the Chinese American Cook who is the father of 'birthright citizenship'". Washington Post. August 31, 2015. ^ a b Wong Kim Ark, 169 U.S. at 699. "The acts of Congress known as the Chinese Exclusion Acts, the earliest of which was passed some fourteen years after the adoption of the Constitutional Amendment, cannot control its meaning or impair its effect, but must be construed and executed in subordination to its provisions." ^ a b Eastman (2006), p. 2. "The positively phrased 'subject to the jurisdiction' of the United States might easily have been intended to describe a broader grant of citizenship than the negatively phrased language from the 1866 Act.... But the relatively sparse debate we have regarding this provision of the Fourteenth Amendment does not support such a reading." ^ a b Wong Kim Ark, 169 U.S. at 715. ^ a b Glen (2007), p. 80. ^ a b Epps (2010), p. 332. ^ a b Eastman (2006), pp. 3–4. "Such was the interpretation of the Citizenship Clause initially given by the Supreme Court, and it was the correct interpretation. As Thomas Cooley noted in his treatise, 'subject to the jurisdiction' of the United States 'meant full and complete jurisdiction to which citizens are generally subject, and not any qualified and partial jurisdiction, such as may consist with allegiance to some other government.'" ^ a b Ho (2006), p. 374. "This sweeping language [in Wong Kim Ark] reaches all aliens regardless of immigration status. To be sure, the question of illegal aliens was not explicitly presented in Wong Kim Ark. But any doubt was put to rest in Plyler v. Doe...."
^ Woodworth (1896), p. 536. ^ a b "Acquisition of U.S. Citizenship by Birth in the United States", 7 FAM 1111(a). ^ Woodworth (1896), p. 537. "[T]he commonly accepted notion in this country, both prior and subsequent to the adoption of the Fourteenth Amendment ... has been that birth within the United States, although of alien parents, was sufficient, of itself, to confer the right of citizenship, without any other requisite, such for instance, as the naturalization proceedings which take place with reference to aliens." ^ Walter Dellinger, Assistant Attorney General (December 13, 1995). "Legislation denying citizenship at birth to certain children born in the United States". Memoranda and Opinions. Office of Legal Counsel, U.S. Department of Justice. Archived from the original on July 25, 2009. Retrieved January 2, 2012. A bill that would deny citizenship to children born in the United States to certain classes of alien parents is unconstitutional on its face. A constitutional amendment to restrict birthright citizenship, although not technically unlawful, would flatly contradict the Nation's constitutional history and constitutional traditions. ^ Lynch v. Clarke, 3 N.Y.Leg.Obs. 236 (N.Y. 1844). ^ Woodworth (1896), p. 538. "As a matter of fact, there was no definition in the constitution, or in any of the Acts of Congress, as to what constituted citizenship, until the enactment of the Civil Rights Bill in 1866, and the adoption of the Fourteenth Amendment in 1868." ^ Woodworth (1896), p. 538. "So generally accepted and acted upon has been the impression that birth in this country ipso facto confers citizenship, that there are, to-day, thousands of persons born in the United States of foreign parents, who consider themselves, and are recognized, legally, as citizens. Among these are very many voters, whose right to vote, because born here of foreign parents, has never been seriously questioned." ^ "Authorities", 7 FAM 1119(d). "Until 1866, the citizenship status of persons born in the United States was not defined in the Constitution or in any federal statute. Under the common law rule of jus soli—the law of the soil—persons born in the United States generally acquired U.S. citizenship at birth." ^ Lynch v. Clarke, 3 N.Y.Leg.Obs. at 250. "Upon principle, therefore, I can entertain no doubt, but that by the law of the United States, every person born within the dominions and allegiance of the United States, whatever were the situation of his parents, is a natural born citizen.... I am bound to say that the general understanding ... is that birth in this country does of itself constitute citizenship.... Thus when at an election, the inquiry is made whether a person offering to vote is a citizen or an alien, if he answers that he is a native of this country, it is received as conclusive that he is a citizen.... The universality of the public sentiment in this instance ... indicates the strength and depth of the common law principle, and confirms the position that the adoption of the Federal Constitution wrought no change in that principle." ^ An Act to establish an [sic] uniform Rule of Naturalization. 1st Cong., Sess. II, Chap. 3; 1 Stat. 103. March 26, 1790. "Be it enacted ... That any alien, being a free white person, who shall have resided within the limits and under the jurisdiction of the United States for the term of two years, may be admitted to become a citizen thereof.... And the children of citizens of the United States, that may be born beyond sea, or out of the limits of the United States, shall be considered as natural born citizens: Provided, That the right of citizenship shall not descend to persons whose fathers have never been resident in the United States...."
^ Dred Scott v. Sandford, 60 U.S. 393 (1857). ^ Schwarz, Frederic D. (February–March 2007). "The Dred Scott Decision". American Heritage. Rockville, MD: American Heritage Publishing. 58 (1). Retrieved August 29, 2011. ^ An Act to protect all Persons in the United States in their Civil Rights, and furnish the Means of their Vindication. 39th Cong., Sess. I, Chap. 31; 14 Stat. 27. April 9, 1866. ^ "Authorities", 7 FAM 1119(e). "This rule was made part of the Civil Rights Act of April 9, 1866 (14 Statutes at Large 27)...."
^ Wong Kim Ark, 169 U.S. at 675. "The same Congress, shortly afterwards, evidently thinking it unwise, and perhaps unsafe, to leave so important a declaration of rights to depend upon an ordinary act of legislation, which might be repealed by any subsequent Congress, framed the Fourteenth Amendment of the Constitution...."
^ Epps, Garrett (2007). Democracy Reborn: The Fourteenth Amendment and the Fight for Equal Rights in Post-Civil War America. Holt Paperbacks. p. 174. ISBN 978-0-8050-8663-8. The opposition made several arguments. The citizenship provision was unconstitutional, they contended, and would grant citizenship, not only to freed slaves, but to Indians living off their reservations, to Chinese born in the United States, and even to gypsies. [Illinois Senator Lyman] Trumbull agreed that it would, opening a chorus of cries that the bill would cede California to China and make America a mongrel nation. ^ Cong. Globe, 39th Cong., 1st Sess. 597 (February 2, 1866). "Congress has no power to make a citizen.... [only] to establish a uniform rule of naturalization." ^ "Law Library of Congress: Fourteenth Amendment and Citizenship". Library of Congress. Retrieved January 2, 2012. However, because there were concerns that the Civil Rights Act might be subsequently repealed or limited the Congress took steps to include similar language when it considered the draft of the Fourteenth Amendment. ^ Stimson, Frederic Jesup (2004). The Law of the Federal and State Constitutions of the United States. Clark, NJ: The Lawbook Exchange. p. 76. ISBN 978-1-58477-369-6. ^ a b c d Cong. Globe, 39th Cong., 1st Sess. 2890 (May 30, 1866). ^ "Law Library of Congress: Fourteenth Amendment and Citizenship". Library of Congress. Retrieved January 2, 2012. The debate in the Senate was conducted in a somewhat acrimonious fashion and focused in part on the difference between the language in the definition of citizenship in the Civil Rights Act of 1866 and the proposed amendment. Specific discussion reviewed the need to address the problem created by the Dred Scott decision, but also the possibility that the language of the Howard amendment would apply in a broader fashion to almost all children born in the United States. The specific meaning of the language of the clause was not immediately obvious. ^ a b Ho (2006), p. 372. "Repeal proponents ... quote Howard's introductory remarks to state that birthright citizenship 'will not, of course, include ... foreigners.' But that reads Howard's reference to 'aliens, who belong to the families of ambassadors or foreign ministers' out of the sentence. It also renders completely meaningless the subsequent dialogue between Senators Cowan and Conness over the wisdom of extending birthright citizenship to the children of Chinese immigrants and Gypsies." ^ Cong. Globe, 39th Cong., 1st Sess. 2890 (May 30, 1866). "I am really desirous to have a legal definition of 'Citizenship of the United States.' What does it mean? What is its length and breadth? ... Is the child of the Chinese immigrant in California a citizen? Is the child of a Gypsy born in Pennsylvania a citizen? ... Why, sir, there are nations of people with whom theft is a virtue and falsehood a merit.... It is utterly and totally impossible to mingle all the various families of men, from the lowest form of the Hottentot up to the highest Caucasian, in the same society.... and in my judgment there should be some limitation, some definition to this term 'citizen of the United States.'" ^ Cong. Globe, 39th Cong., 1st Sess. 2891 (May 30, 1866). ^ Cong. Globe, 39th Cong., 1st Sess. 2892 (May 30, 1866). "And yet by a constitutional amendment you propose to declare the Utes, the Tabahuaches, and all those wild Indians to be citizens of the United States, the great Republic of the world, whose citizenship should be a title as proud as that of king, and whose danger is that you may degrade that citizenship." ^ Ho (2006), p. 372. "But although there was virtual consensus that birthright citizenship should not be extended to the children of Indian tribal members, a majority of Senators saw no need for clarification." ^ Cong. Globe, 39th Cong., 1st Sess. 2897 (May 30, 1866). ^ Cong. Globe, 39th Cong., 1st Sess. 3149 (June 13, 1866). ^ Proclamation by William H. Seward, Secretary of State, July 28, 1868. ^ Liu, Goodwin (2006). "Education, Equality, and National Citizenship" (PDF). Yale Law Journal. 116: 349. doi:10.2307/20455723. Archived from the original (PDF) on July 6, 2011. Retrieved January 6, 2012. ^ "Elizabeth B. Wydra". Huffington Post. Retrieved January 6, 2012. ^ Wydra, Elizabeth (2009). "Birthright Citizenship: A Constitutional Guarantee" (PDF). American Constitution Society for Law and Policy. p. 6. Archived from the original (PDF) on 2013-07-30. Retrieved January 6, 2012. For example, Senator Cowan expressed concern that the proposal would expand the number [sic] Chinese in California and Gypsies in his home state of Pennsylvania by granting birthright citizenship to their children, even (as he put it) the children of those who owe no allegiance to the United States and routinely commit 'trespass' within the United States. Supporters of Howard's proposal did not respond by taking issue with Cowan's understanding, but instead by agreeing with it and defending it as a matter of sound policy. ^ Ho (2006), p. 370. "[Senator Howard's] understanding was universally adopted by other Senators. Howard's colleagues vigorously debated the wisdom of his amendment—indeed, some opposed it precisely because they opposed extending birthright citizenship to the children of aliens of different races. But no Senator disputed the meaning of the amendment with respect to alien children." ^ Aynes, Richard L. (2006). "Unintended consequences of the Fourteenth Amendment and what they tell us about its interpretation". Akron Law Review. 39: 289. Retrieved January 6, 2012. ^ Salyer (2005), p. 56. ^ Additional Articles to the Treaty between the United States of America and the Ta-Tsing Empire of the 18th of June, 1858 Archived 2018-09-23 at the Wayback Machine, 16 Stat. 739. July 28, 1868. ^ "English and Chinese Text of the Burlingame Treaty 1868". Retrieved January 5, 2012. ^ Meyler, Bernadette (Spring 2001). "The Gestation of Birthright Citizenship, 1868–1898 States' Rights, the Law of Nations, and Mutual Consent". Georgetown Immigration Law Journal. 15: 521–525. ^ Aarim-Heriot, Najia. Chinese Immigrants, African Americans, and Racial Anxiety in the United States, 1848–82. Champaign, IL: University of Illinois Press. pp. 108–112. ISBN 0-252-02775-2. ^ Salyer (2005), p. 57. ^ An act to execute certain treaty stipulations relating to Chinese. 47th Cong., Sess. I, Chap. 126; 22 Stat. 58. May 6, 1882. ^ Dake, B. Frank (September 1905). "The Chinaman before the Supreme Court". Albany Law Journal. 67 (9): 259–260. ^ An act a supplement to an act entitled "An act to execute certain treaty stipulations relating to Chinese". Archived 2012-02-18 at the Wayback Machine 50th Cong., Sess. I, Chap. 60; 25 Stat. 504. October 1, 1888. ^ An act to prohibit the coming of Chinese persons into the United States. Archived 2012-04-22 at the Wayback Machine 52nd Cong., Sess. I, Chap. 60; 27 Stat. 25. May 5, 1892. ^ Elinson and Yogi (2009), p. 46. ^ "Chinese Exclusion Act (1882)". Our Documents. Retrieved September 5, 2011. ^ Woodworth (1896), p. 538. "It is significant that since the adoption of the Fourteenth Amendment, the question has arisen simply with reference to Chinese and Indians." ^ "Native Americans and Eskimos", 7 FAM 1117(a). "Before U.S. v. Wong Kim Ark, the only occasion on which the Supreme Court had considered the meaning of the 14th Amendment's phrase 'subject to the jurisdiction' of the United States was in Elk v. Wilkins, 112 U.S. 94 (1884)." ^ a b c Berger, Birthright Citizenship on Trial, p. 1192. ^ a b In re Look Tin Sing, 21 F. 905 (Cir.Cal. 1884). Thayer, James Bradley (1894). Cases on constitutional law, with notes (Part 2). Charles W. Sever. pp. 578–582. Retrieved January 2, 2012. ^ "Look Tin Sing: An Important Case Argued in the Circuit Court Yesterday". UCR California Digital Newspaper Collection. Daily Alta California,Volume 37, Number 12586, 28 September 1884. Retrieved 21 February 2019. ^ a b c "In re Look Tin Sing (Ruling)" (PDF). libraryweb.uchastings.edu. Federal Reporter 21 F. 905, Circuit Court, D. California, September 29, 1884. Retrieved 21 February 2019. ^ "University of New Hampshire – History Department – Faculty Profiles". Archived from the original on 2013-06-22. Retrieved January 31, 2012. ^ Salyer (2005), p. 60. ^ Lee, Erika (2003). At America's gates: Chinese immigration during the exclusion era, 1882–1943. University of North Carolina Press. p. 103. ISBN 978-0-8078-5448-8. Retrieved January 2, 2012. ^ Ex parte Chin King, Ex parte Chan San Hee, 35 F. 354 (Cir.Ore. 1888). Snow, Freeman (1893). Cases and opinions on international law, with notes and a syllabus. Boston Book Co. pp. 219–222. Retrieved March 28, 2017. ^ Gee Fook Sing v. U.S., 49 F. 146 (9th Cir. 1892). ^ a b Woodworth (1896), p. 537. "On the other hand, the Supreme Court, in the Slaughter-house cases, used language which indicates that it then considered the provision as declaratory of the doctrine of the law of nations." ^ Wong Kim Ark, 169 U.S. at 678. "This was wholly aside from the question in judgment, and from the course of reasoning bearing upon that question." ^ a b c Woodworth (1896), p. 538. "The Supreme Court, singular to say, has never directly passed on the political status of children born in this country of foreign parents. The question was not directly involved in the Slaughter-house cases, and what the court there stated is, therefore, dictum, and was so treated by Judge Morrow in the Wong Kim Ark case." ^ a b Semonche (1978), p. 112. "Gray then sidestepped language in earlier opinions of the Court that said children born of alien parents are not citizens by saying, in effect, that such conclusions were gratuitous statements not necessary to the decisions in those cases and therefore entitled to no weight as precedent." ^ Epps (2010), pp. 348–349. ^ Mensel, Robert (2013). "Jurisdiction in Nineteenth Century International Law and its Meaning in the Citizenship Clause of the Fourteenth Amendment" (PDF). Saint Louis University Public Law Review. 32: 340. Archived from the original (PDF) on 2015-09-24. Retrieved 2015-08-21. ^ Wong Kim Ark, 169 U.S. at 649. "This was a writ of habeas corpus ... in behalf of Wong Kim Ark, who alleged that he ... was born at San Francisco in 1873 ...."
^ Glen (2007), p. 74. ^ Elinson and Yogi (2009), p. 51. ^ Davis, Lisa (November 4, 1998). "The Progeny of Citizen Wong". SF Weekly. Retrieved July 17, 2011. Wong Kim Ark spent most of his life as a cook in various Chinatown restaurants. In 1894, Wong visited his family in China. ^ a b Wong Kim Ark, 169 U.S. at 650. "Because the said Wong Kim Ark, although born in the city and county of San Francisco, State of California, United States of America, is not, under the laws of the State of California and of the United States, a citizen thereof, the mother and father of the said Wong Kim Ark being Chinese persons and subjects of the Emperor of China, and the said Wong Kim Ark being also a Chinese person and a subject of the Emperor of China." ^ Collins, George D. (May–June 1895). "Citizenship by Birth". American Law Review. 29: 385–394. ...[W]ere it not for the fact that the executive department of the general government has apparently acquiesced in Judge Field's [Look Tin Sing] decision as a correct interpretation of the law, we might well be indifferent to what he did or did not decide in the particular case before the Circuit Court, knowing as we do that when the question is ultimately brought before the Supreme Court of the United States, Judge Field's views will not be sustained. ^ Salyer (2005), p. 66. ^ Salyer (2005), p. 67. ^ Woodworth (1898), p. 556. "From this refusal to permit him to land, a writ of habeas corpus was sued out in the United States District Court .... [T]hat court discharged Wong Kim Ark on the ground that he was a citizen of the United States by virtue of his birth in this country, and that the Chinese Exclusion Acts were therefore inapplicable to him." ^ In re Wong Kim Ark, 71 F. 382 Archived 2010-05-13 at the Wayback Machine (N.D.Cal. 1896). ^ Elinson and Yogi (2009), p. 52. ^ Woodworth (1896), p. 536. "In the United States, the [citizenship] question must depend upon the interpretation to be given to the first clause of the Fourteenth Amendment to the Constitution, but the peculiar language of a phrase in that provision renders it a somewhat debatable point as to whether the provision was intended to be declaratory of the common law or of the international doctrine." ^ Woodworth (1898), p. 555. "While the question before the Supreme Court was, what constitutes citizenship of the United States under the Fourteenth Amendment, still the peculiar phraseology of the citizenship clause of that Amendment necessarily involved the further and controlling proposition as to what that clause was declaratory of; whether it was intended to be declaratory of the common law or of the international doctrine." ^ In re Wong Kim Ark, 71 F. at 386. ^ Rodriguez (2009), pp. 1364–1366. "[W]hat weight do we assign the Supreme Court's first attempts to interpret the [Citizenship Clause] after its passage (the extension of the Citizenship clause to children of immigrants not eligible for citizenship in Wong Kim Ark)? ... and ambiguity as to whether the Clause extended to the children of Chinese immigrants persisted until the Supreme Court interpreted the Clause in Wong Kim Ark." ^ In re Wong Kim Ark, 71 F. at 391. "That this last sentence, which is the expression relied on by counsel for the government, is mere dictum, is plain from what has been stated as the issue involved in those cases." ^ Woodworth (1896), p. 537. "The rule laid down by the Supreme Court in Elk v. Wilkins, with respect to the political status of Indians is, however, not applicable to that of Chinese, or persons other than Chinese, born here of foreign parents." ^ In re Wong Kim Ark, 71 F. at 391. "Nor does the interpretation of the phrase in question in the case of Elk v. Wilkins ... dispose of the matter." ^ Woodworth (1896), p. 537. "The decisions, which have passed upon the political status of Chinese born here, were all rendered in the Ninth Circuit, and they hold that the Fourteenth Amendment was intended to be declaratory of the common-law rule and that birth in this country is sufficient to confer the right of citizenship." ^ In re Wong Kim Ark, 71 F. at 391. "That being so, the observations referred to and relied upon, however persuasive they may appear to be, cannot be accepted as declaring the law in this circuit, at least as against the authority of In re Look Tin Sing, where the question was squarely met and decisively settled." ^ Slaughterhouse Cases, 83 U.S. at 74. ^ "The native-born Chinese are legally adjudged to be citizens". San Francisco Chronicle. January 4, 1896. p. 12. Judge Morrow decided yesterday that a Chinese, though a laborer, if born in this country, is a citizen of the United States, and as such cannot lose his right to land here again after leaving the country. ^ Order of the District Court of the United States, Northern District of California, "In the Matter of Wong Kim Ark", January 3, 1896, U.S. National Archives and Records Administration. Retrieved July 17, 2011. ^ Woodworth (1898), p. 556. "Upon a hearing duly had, that [district] court discharged Wong Kim Ark on the ground that he was a citizen of the United States by virtue of his birth in this country, and that the Chinese Exclusion Acts were therefore inapplicable to him." ^ In re Wong Kim Ark, 71 F. at 392. "Arriving at the conclusion, as I do, after careful investigation and much consideration, that the supreme court has as yet announced no doctrine at variance with that contained in the Look Tin Sing decision and the other cases alluded to, I am constrained to follow the authority and law enunciated in this circuit.... The doctrine of the law of nations, that the child follows the nationality of the parents, and that citizenship does not depend upon mere accidental place of birth, is undoubtedly more logical, reasonable, and satisfactory, but this consideration will not justify this court in declaring it to be the law against controlling judicial authority.... From the law as announced and the facts as stipulated, I am of opinion [sic] that Wong Kim Ark is a citizen of the United States within the meaning of the citizenship clause of the fourteenth amendment." ^ Woodworth (1896), p. 554. "I understand that the Wong Kim Ark case will be appealed to the Supreme Court, and, therefore, this at once delicate and important question will receive the consideration of that able tribunal, and the subject be set at rest so far as the existing law is concerned." ^ Wong Kim Ark, 169 U.S. at 652. "The [district] court ordered Wong Kim Ark to be discharged, upon the ground that he was a citizen of the United States. The United States appealed to this court...."
^ Salyer (2005), p. 69. ^ Semonche (1978), p. 111. ^ Wong Kim Ark, 169 U.S. at 652. ^ Ashton, J. Hubley (February 1976). "Lincolniana: A Glimpse of Lincoln in 1864". Journal of the Illinois State Historical Society. 69 (1): 67–69. The reminiscence printed below was written by J. Hubley Ashton, assistant attorney general of the United States from 1864 to 1869. ^ "Biographies: Thomas D. Riordan". Federal Judicial Center. Retrieved January 17, 2012. ^ Semonche (1978), p. 111. "Since [Associate Justice Joseph] McKenna did not hear the oral arguments, he did not participate in the decision." ^ Wong Kim Ark, 169 U.S. at 732. "MR. JUSTICE McKENNA, not having been a member of the court when this case was argued, took no part in the decision." ^ "Wong Kim Ark Is a Citizen: Supreme Court Decision in Case of Chinese Born in America". Washington Post. March 29, 1898. p. 11. ^ American Society of International Law (1914). "Judicial Decisions Involving Questions of International Law". American Journal of International Law. New York: Baker, Voorhis & Co. 8: 672. ^ Woodworth (1898), p. 556. "Mr. Justice Gray wrote the prevailing opinion, which was concurred in by all the justices excepting Mr. Chief Justice Fuller and Mr. Justice Harlan, both of whom dissented. Mr. Justice McKenna, not having been a member of the court when the arguments took place, did not participate in the decision." ^ a b c Kirkland, Brooke (2006). "Limiting the Application of Jus Soli: The Resulting Status of Undocumented Children in the United States". Buffalo Human Rights Law Review. 12: 200. ^ Woodworth (1898), p. 559. "In arriving at the conclusion that Wong Kim Ark was a citizen of the United States, although born in this country of foreign parents, the court uses the following language...."
^ Bouvier, John (1914). "Citizen". Bouvier's Law Dictionary and Concise Encyclopedia. 1. Kansas City, MO: Vernon Law Book Company. p. 490. ^ The Schooner Exchange v. M'Faddon, 11 U.S. (7 Cranch) 116, 136 (1812). ^ Wong Kim Ark, 169 U.S. at 683. ^ Woodworth (1898), p. 559. "The refusal of Congress to permit the naturalization of Chinese persons cannot exclude Chinese persons born in this country from the operation of the constitutional declaration that all persons born in the United States, and subject to the jurisdiction thereof, are citizens of the United States." ^ Bouvier, John (1914). "Chinese". Bouvier's Law Dictionary and Concise Encyclopedia. 1. Kansas City, MO: Vernon Law Book Co. p. 482. ^ Wong Kim Ark, 169 U.S. at 655–656. ^ Woodworth (1898), pp. 560–561. ^ a b Yale Law Journal (1898). "Jetsam and Flotsam: Citizenship of Chinaman Born in United States". Central Law Journal. St. Louis: Central Law Journal Company. 46: 519. Although hopelessly in the minority, Chief Justice Fuller, with whom Mr. Justice Harlan agrees, dissents from this opinion, and, upon what appears to be the better view, holds that the common law of England does not control the question under discussion. ^ Wong Kim Ark, 169 U.S. at 713. ^ Wong Kim Ark, 169 U.S. at 709. "The framers of the Constitution were familiar with the distinctions between the Roman law and the feudal law, between obligations based on territoriality and those based on the personal and invisible character of origin, and there is nothing to show that, in the matter of nationality, they intended to adhere to principles derived from regal government, which they had just assisted in overthrowing. Manifestly, when the sovereignty of the Crown was thrown off and an independent government established, every rule of the common law and every statute of England obtaining in the Colonies in derogation of the principles on which the new government was founded was abrogated." ^ Glen (2007), p. 77. ^ a b Wong Kim Ark, 169 U.S. at 731. ^ The question of whether the Constitution could override a treaty remained unresolved until a 1957 Supreme Court case, Reid v. Covert, 354 U.S. 1 (1957). ^ Wong Kim Ark, 169 U.S. at 721. ^ Wong Kim Ark, 169 U.S. at 725 n.2. ^ Wong Kim Ark, 169 U.S. at 726. ^ Glen (2007), p. 79. ^ Przybyszewski, Linda (1999). The Republic According to John Marshall Harlan. Chapel Hill, NC: University of North Carolina Press. pp. 120–121. ISBN 0-8078-2493-3. ^ "Marshal [sic] B. Woodworth Inducted into Office". San Francisco Chronicle. March 20, 1901. p. 14. Marshall B. Woodworth, who was recently appointed United States Attorney for the Northern District of California ... took the oath of office yesterday before Judge Morrow in the United States Circuit Court. ^ "Marshall B. Woodworth Killed". New York Times. April 19, 1943. p. 21. Marshall B. Woodworth, 66, former United States attorney in San Francisco, was struck and killed by an automobile yesterday. ^ a b Woodworth (1898), p. 561. ^ Woodworth (1898), p. 556. ^ "Questions of Citizenship". San Francisco Chronicle. March 30, 1898. p. 6. ^ "Findings and Decree" denying Wong Yoke Fun's application for admission to the United States. December 27, 1910. U.S. National Archives and Records Administration, San Bruno, California. ^ Last page of the transcript of Wong Yook Jim's immigration hearing, showing that he is being admitted to the United States. July 23, 1926. U.S. National Archives and Records Administration, San Bruno, California. ^ Wadley, James B. (Fall 2006). "Indian Citizenship and the Privileges and Immunities Clauses of the United States Constitution: An Alternative to the Problems of the Full Faith and Credit and Comity?". Southern Illinois University Law Journal. 31: 47. ^ An Act to authorize the Secretary of the Interior to issue certificates of citizenship to Indians. Archived 2016-03-13 at the Wayback Machine Pub.L. 68–175; 43 Stat. 253. June 2, 1924. ^ Haas, Theodore (May 1957). "The Legal Aspects of Indian Affairs from 1887 to 1957". Annals of the American Academy of Political and Social Science. Thousand Oaks, CA: SAGE Publications. 311: 12–22. doi:10.1177/000271625731100103. JSTOR 1032349. ^ "Native Americans and Eskimos", 7 FAM 1117(b). "The Act of June 2, 1924 was the first comprehensive law relating to the citizenship of Native Americans." ^ An Act to repeal the Chinese Exclusion Acts, to establish quotas, and for other purposes. Pub.L. 78–199; 57 Stat. 600. December 17, 1943. ^ An Act to amend the Immigration and Nationality Act, and for other purposes. Pub.L. 89–236; 79 Stat. 911. October 3, 1965. ^ Elinson and Yogi (2009), p. 63. ^ Low, Elaine (2008). "An Unnoticed Struggle: A Concise History of Asian American Civil Rights Issues" (PDF). San Francisco: Japanese American Citizens League. p. 4. Archived from the original (PDF) on June 13, 2010. Retrieved January 27, 2012. ^ See, e.g., Rogers v. Bellei, 401 U.S. 815, 828 (1971). "The [Wong Kim Ark] Court concluded that 'naturalization by descent' was not a common law concept, but was dependent, instead, upon statutory enactment." ^ a b See, e.g., Nishikawa v. Dulles, 356 U.S. 129, 138 (1958). "Nishikawa was born in this country while subject to its jurisdiction; therefore, American citizenship is his constitutional birthright. See United States v. Wong Kim Ark.... What the Constitution has conferred, neither the Congress, nor the Executive, nor the Judiciary, nor all three in concert, may strip away." ^ Kwock Jan Fat v. White, 253 U.S. 454, 457 (1920). "It is not disputed that if petitioner is the son of [his alleged parents], he was born to them when they were permanently domiciled in the United States, is a citizen thereof, and is entitled to admission to the country. United States v. Wong Kim Ark...."
^ Weedin v. Chin Bow, 274 U.S. 657, 660 (1927). "United States v. Wong Kim Ark ... establishes that, at common law in England and the United States, the rule with respect to nationality was that of the jus soli...."
^ Morrison v. California, 291 U.S. 82, 85 (1934). "A person of the Japanese race is a citizen of the United States if he was born within the United States. United States v. Wong Kim Ark...."
^ Hennessy v. Richardson Drug Co., 189 U.S. 25, 34 (1903). "United States v. Wong Kim Ark ... said: 'The term "citizen", as understood in our law, is precisely analogous to the term "subject" in the common law...."
^ Schick v. United States, 195 U.S. 65, 69 (1904). "In United States v. Wong Kim Ark ...: 'In this as in other respects, [a constitutional provision] must be interpreted in the light of the common law, the principles and history of which were familiarly known to the framers of the Constitution....'"
^ Kennedy v. Mendoza-Martinez, 372 U.S. 144, 159 n.10 (1963). "[The Citizenship Clause] is to be interpreted in light of preexisting common law principles governing citizenship. United States v. Wong Kim Ark...."
^ a b c Plyler v. Doe, 457 U.S. 202, 211 n.10 (1982). "Justice Gray, writing for the Court in United States v. Wong Kim Ark ... detailed at some length the history of the Citizenship Clause, and the predominantly geographic sense in which the term 'jurisdiction' was used. He further noted that it was 'impossible to construe the words "subject to the jurisdiction thereof" ... as less comprehensive than the words "within its jurisdiction" ... or to hold that persons "within the jurisdiction" of one of the States of the Union are not "subject to the jurisdiction of the United States."' ... As one early commentator noted, given the historical emphasis on geographic territoriality, bounded only, if at all, by principles of sovereignty and allegiance, no plausible distinction with respect to Fourteenth Amendment 'jurisdiction' can be drawn between resident aliens whose entry into the United States was lawful, and resident aliens whose entry was unlawful." ^ "Asks U.S. Japanese Lose Citizenship". New York Times. June 27, 1942. p. 6. ^ "Japanese Citizens Win a Court Fight". New York Times. July 3, 1942. p. 7. ^ Regan v. King, 49 F. Supp. 222 (N.D.Cal. 1942). "It is unnecessary to discuss the arguments of counsel. In my opinion the law is settled by the decisions of the Supreme Court just alluded to, and the action will be dismissed, with costs to the defendant." ^ Regan v. King, 134 F.2d 413 (9th Cir. 1943). "On the authority of the fourteenth Amendment to the Constitution, making all persons born in the United States citizens thereof, as interpreted by the Supreme Court of the United States in United States v. Wong Kim Ark, ... and a long line of decisions, including the recent decision in Perkins, Secretary of Labor et al. v. Elg, ... the judgment of dismissal, 49 F.Supp. 222, is Affirmed." ^ Regan v. King, cert. denied, 319 U.S. 753 (1943). ^ Nolos v. Holder, 611 F.3d 279, 284 (5th Cir. 2010). "Nolos urges that his parents acquired United States citizenship at birth because the Philippines were under the dominion and control of the United States at the time of their births. But as have the Ninth and the Second Circuits before us ... we decline to give Wong Kim Ark such an expansive interpretation. As the Second Circuit explained, the question of the territorial scope of the Citizenship Clause of the Fourteenth Amendment was not before the court in Wong Kim Ark." See also Rabang v. INS, 35 F.3d 1449, 1454 (9th Cir. 1994), and Valmonte v. INS, 136 F.3d 914, 920 (2nd Cir. 1998). ^ Halagao, Avelino J. (1998). "Citizens Denied: A Critical Examination of the Rabang Decision Rejecting United States Citizenship Claims by Persons Born in the Philippines During the Territorial Period". UCLA Asian Pacific American Law Journal. 5: 77. ^ a b Oforji v. Ashcroft, 354 F.3d 609 (7th Cir. 2003). "[O]ne rule that Congress should rethink ... is awarding citizenship to everyone born in the United States (... United States v. Wong Kim Ark ...), including the children of illegal immigrants whose sole motive in immigrating was to confer U.S. citizenship on their as yet unborn children.... We should not be encouraging foreigners to come to the United States solely to enable them to confer U.S. citizenship on their future children.... A constitutional amendment may be required to change the rule ... but I doubt it.... Congress would not be flouting the Constitution if it amended the Immigration and Nationality Act to put an end to the nonsense.... Our [judges'] hands, however, are tied. We cannot amend the statutory provisions on citizenship and asylum." ^ a b "'Subject to the Jurisdiction of the United States'", 7 FAM 1111(d). "All children born in and subject, at the time of birth, to the jurisdiction of the United States acquire U.S. citizenship at birth even if their parents were in the United States illegally at the time of birth. ... Pursuant to [Wong Kim Ark]: (a) Acquisition of U.S. citizenship generally is not affected by the fact that the parents may be in the United States temporarily or illegally; and that (b) A child born in an immigration detention center physically located in the United States is considered to have been born in the United States and be subject to its jurisdiction. This is so even if the child's parents have not been legally admitted to the United States and, for immigration purposes, may be viewed as not being in the United States." ^ Ho (2006), p. 366. "There is increasing interest in repealing birthright citizenship for the children of aliens—especially undocumented persons." ^ "'Border Baby' boom strains S. Texas". Houston Chronicle. September 24, 2006. Retrieved July 17, 2011. Immigration-control advocates regard the U.S.-born infants as 'anchor babies' because they give their undocumented parents and relatives a way to petition for citizenship. ^ Wong, William (April 8, 1998). "The citizenship of Wong Kim Ark". San Francisco Examiner. Retrieved September 10, 2011. ^ Eastman (2006), p. 4. "Justice Gray simply failed to appreciate what he seemed to have understood in Elk [v. Wilkins], namely, that there is a difference between territorial jurisdiction, on the one hand, and the more complete, allegiance-obliging jurisdiction that the Fourteenth Amendment codified, on the other." ^ Eastman (2006), p. 6. "Indeed, Congress has by its own actions with respect to Native Americans—both before and after this Court's decision in Wong Kim Ark—rejected the claim that the Citizenship Clause itself confers citizenship merely by accident of birth. None of these citizenship acts would have been necessary—indeed, all would have been redundant—under the expansive view of the Citizenship Clause propounded by Justice Gray." ^ "Indians and Invaders: The Citizenship Clause and Illegal Aliens" (PDF). University of Pennsylvania Journal of Constitutional Law. Philadelphia: University of Pennsylvania. 10 (3): 509. March 2008. Retrieved July 17, 2011. The Court has not revisited Wong Kim Ark, but Schuck and Smith offer a reading of the Citizenship Clause that connects the exclusions to birthright citizenship with a principle of reciprocal consent or allegiance. ^ Graglia, Lino (2009). "Birthright citizenship for children of illegal aliens: an irrational public policy". Texas Review of Law and Politics. Austin, TX: University of Texas, Austin. 14 (1): 10. ^ Epps (2010), p. 333. ^ Epps (2010), p. 381. ^ Rodriguez (2009), p. 1367. ^ a b Rodriguez (2009), pp. 1363–1364. ^ Ho (2006), p. 368. ^ Plyler v. Doe, 457 U.S. 202 (1982). ^ a b Eisgruber, Christopher L. (1997). "Birthright Citizenship and the Constitution". New York University Law Review. 72: 54–96. ^ Ho, James C. (March 2008). "Commentary: Birthright Citizenship, the Fourteenth Amendment, and State Authority". University of Richmond Law Review. 42: 973. Archived from the original on 2012-04-02. ^ Dunklee, Dennis R.; Shoop, Robert J. (2006). The Principal's Quick-Reference Guide to School Law. Thousand Oaks, CA: Corwin Press. p. 241. ISBN 978-1-4129-2594-5. ^ Plyler v. Doe, 457 U.S. at 243. "I have no quarrel with the conclusion that the Equal Protection Clause of the Fourteenth Amendment applies to aliens who, after their illegal entry into this country, are indeed physically 'within the jurisdiction' of a state." ^ Wood, Charles (1999). "Losing Control of America's Future—The Census, Birthright Citizenship, and Illegal Aliens". Harvard Journal of Law and Public Policy. 22: 522. The needed reforms should be completed expeditiously.... [I]n every week that passes thousands more children of illegal aliens are born in this country, and each is now granted citizenship.... If these reforms are not accomplished one way or another soon, 'We the People of the United States' risk losing control of the nation's future. ^ Salyer (2005), p. 79. ^ Ngai, Mae M. (2007). "Birthright Citizenship and the Alien Citizen". Fordham Law Review. 75: 2524. ^ Birthright Citizenship Act of 2009, H.R. 1868, 111th Cong. April 2, 2009. ^ Birthright Citizenship Act of 2011, H.R. 140, 112th Cong. January 5, 2011. ^ Birthright Citizenship Act of 2011, S. 723, 112th Cong. April 5, 2011. ^ Proposing an amendment to the Constitution of the United States relating to United States citizenship, S.J.Res. 6, 111th Cong. January 16, 2009. ^ Proposing an amendment to the Constitution of the United States relating to United States citizenship, S.J.Res. 2, 112th Cong. January 25, 2011. ^ "Citizenship-By-Birth Faces Challenges". National Public Radio. May 28, 2010. Retrieved January 29, 2012. ^ "Arizona Senate Panel Passes Sweeping Bills Targeting Illegals, Birthright Citizenship". FOX News. February 23, 2011. Retrieved January 29, 2012. ^ "ACLU of Arizona Responds to Anti-14th Amendment Proposal Introduced Today By Arizona Lawmakers". American Civil Liberties Union. January 27, 2011. Retrieved January 29, 2012. ^ "Trump Says He Will Void Birthright Citizenship Law Through Executive Order". NPR. October 30, 2018. ^ "Trump vows to end birthright citizenship with an executive order. Speaker Ryan says no way". NBC News. October 30, 2018. ^ "What is birthright citizenship, something Trump wants to end?". Miami Herald. October 30, 2018. ^ a b "Paul Ryan Dismisses Trump Plan To Void Birthright Citizenship Law By Executive Order". NPR. October 30, 2018. "Foreign Affairs Manual, Volume 7 (7 FAM)". United States Department of State. August 21, 2009. Archived from the original on 2012-01-25. Retrieved January 27, 2012. Eastman, John C. (March 30, 2006). "From Feudalism to Consent: Rethinking Birthright Citizenship". Legal Memorandum No. 18. Washington D.C.: The Heritage Foundation. Archived from the original on July 4, 2011. Retrieved July 2, 2011. Elinson, Elaine; Yogi, Stan (2009). Wherever There's a Fight: How Runaway Slaves, Suffragists, Immigrants, Strikers and Poets Shaped Civil Liberties in California. Berkeley, CA: Heyday Books. ISBN 978-1-59714-114-7. Epps, Garrett (2010). "The Citizenship Clause: A 'Legislative History'". American University Law Review. 60 (2): 329–388. Retrieved January 14, 2012. Glen, Patrick J. (Fall 2007). "Wong Kim Ark and Sentencia que Declara Constitucional la Ley General de Migración 285-04 in Comparative Perspective: Constitutional Interpretation, Jus Soli Principles, and Political Morality". University of Miami Inter-American Law Review. 39 (1): 67–109. JSTOR 40176768. Ho, James C. (2006). "Defining 'American': Birthright Citizenship and the Original Understanding of the 14th Amendment" (PDF). The Green Bag. 9 (4): 366. Archived from the original (PDF) on October 30, 2010. Retrieved January 6, 2012. Rodriguez, Cristina M. (2009). "The Second Founding: The Citizenship Clause, Original Meaning, and the Egalitarian Unity of the Fourteenth Amendment". University of Pennsylvania Journal of Constitutional Law. 11: 1363–1371. Salyer, Lucy E. (2005). "Wong Kim Ark: The Contest Over Birthright Citizenship". In Martin, David; Schuck, Peter (eds.). Immigration Stories. New York: Foundation Press. ISBN 1-58778-873-X. Semonche, John E. (1978). Charting the Future: The Supreme Court Responds to a Changing Society, 1890–1920. Westport, CT: Greenwood Press. ISBN 0-313-20314-8. LCCN 77-94745. Woodworth, Marshall B. (1896). "Citizenship of the United States under the Fourteenth Amendment". American Law Review. St. Louis: Review Pub. Company. 30: 535–555. Woodworth, Marshall B. (1898). "Who Are Citizens of the United States? Wong Kim Ark Case". American Law Review. St. Louis: Review Pub. Company. 32: 554–561. Wikimedia Commons has media related to Wong Kim Ark.